⬅ What Inspires YOU this Monday? I know how easy those phrases of condemnation can slip into the closet of your mind and pop out to torment you in the dark of night. “If only I had,” and “I should have,” and “Why didn’t I?” rattle around and poke you awake in the middle of the night and demand your attention—keeping you from sweet sleep and filling you with the choking miasma of regret. Those thoughts? They are weapons of the forces of darkness trying to drag you down and teach you to hate yourself with a crippling intensity that keeps you from making progress towards the Light. Satan likes to hear us beat ourselves up, condemn ourselves and spend endless hours tormenting ourselves for our past actions and mistakes because those things distract us from truth. And it seems that the more I beat myself up, the less patience I have with others. The more I criticize myself, the more I criticize others. When I treat myself in a hateful, unloving way, it becomes so much easier to treat others in a hateful, unloving way. Pretty soon, I have even more reasons to dislike myself (and dislike others even more). Jesus talks about the key to loving others in Matthew 23:38-39 when he summarizes the law of God. First, we are to love God. Second, he tells us that we must “Love your neighbor as yourself.” If we don’t love ourselves, we can’t love others. I don’t think he’s talking about the kind of love that says, “Hey, look at me! I’m so cool, important and worthy.” After all, 1 Corinthians 13 makes it clear that love isn’t something shouty or boastful. Instead, it’s something patient, loving and kind that keeps no records of wrongs. How often do we try to show this kind of love to others but refuse to extend it to ourselves? And then it hit me. What if I directed the message at myself? After all, Jesus is trying to tell us how to love others—and he also tells us that we must love ourselves! What if we read the verse this way? In treating ourselves kindly, we find the grace and courage to treat others kindly. 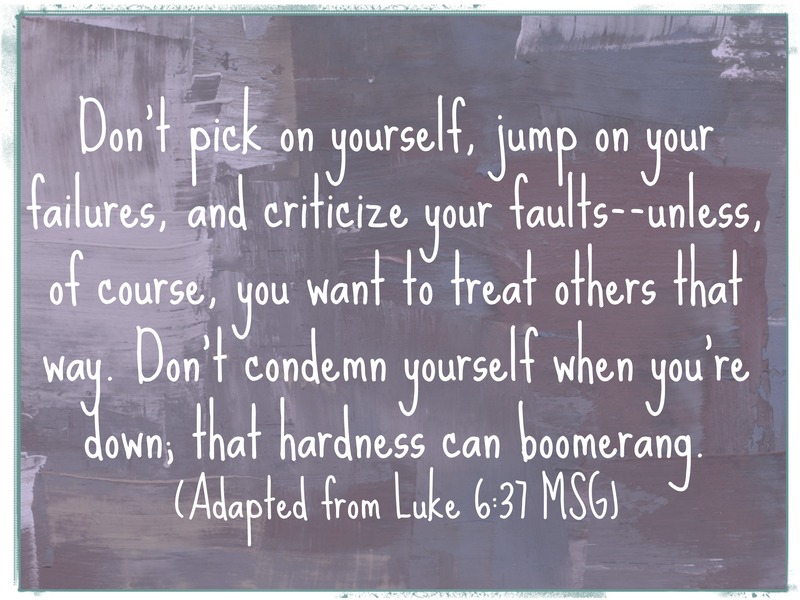 When I examine my bad attitudes towards others, I often find that I harbor a bad attitude about myself. When I judge others harshly, I’m usually secretly judging myself. And so, my friend, go easy on yourself. Slam the closet door on those litanies of regret and self-condemnation. Claim God’s promise that in Christ, you are a new creation (2 Cor. 5:17)—and spending time with your Creator every day so that he can reveal his handiwork in your life and through your life. Dare to go deeper in your relationship with God (and in analyzing the way you treat yourself).